THE verbal fusillade from his Muslim vote-bank, secular stablemates and the Congress was enough for Uttar Pradesh Chief Minister Mulayam Singh Yadav to do a flip-flop on the controversial Babri affidavit. THE Supreme Court's September 16 decision prohibiting disinvestment in two major public sector oil undertakings, HPCL and BPCL, had put paid to the government's disinvestment plans. On Monday, the apex court agreed to take a fresh look at the judgement, giving a ray of hope to the government. CHIEF MINISTER in this country usually tend to blow out of proportion their own achievements, real or imagined. Here is an exception: the Punjab Chief Minister, Capt Amarinder Singh. ONCE again the issue of codifying the privileges of legislatures has come to the fore with the sentencing of various journalists for a breach of privilege of the Tamil Nadu Assembly. The House has given its assent to the recommendation of the Privileges Committee under Rule 229 (d) of the Tamil Nadu Legislative Assembly Rules. Any protection for human beings? IN a currently popular film “Bagbaan” there is a particularly touching scene. All the four sons decide that none of them can afford to take care of both the parents so they divide a parent each and keep them by turns. The youngest son says he’ll keep both the dogs because he can’t see them pining for each other. Is it really symptomatic of our times? AS the man behind the cash counter holds up your currency note against light or turns it over, you miss a beat. What if it is fake? Will he or won’t he accept it? As you jingle gold bangles, you worry, if these are of pure gold or not? As you read headlines of intruders being shot crossing the LoC in Kashmir, you wonder, if there is a system to detect trespassing? TEN years ago it would have been unusual to see women in beauty parlours in Pakistan. But the spread of cable television and more women entering the workplace has brought drastic changes, reports Xinhua. THE verbal fusillade from his Muslim vote-bank, secular stablemates and the Congress was enough for Uttar Pradesh Chief Minister Mulayam Singh Yadav to do a flip-flop on the controversial Babri affidavit. The UP government's reply clearly opposed a petition before the Supreme Court that wants the criminal conspiracy charges against senior BJP leaders, including Deputy Prime Minister L.K. Advani, too be restored. The reply was bound to raise eyebrows. The state government's advocate-on-record in the apex court was sacked for "exceeding his brief" and the government promised a fresh affidavit to undo the "wrong" done to its image. Encouraged by the Mulayam Singh government's about-turn on the Babri affidavit, the Congress has wisely chosen to play down its differences with the Samajwadi Party-led coalition in UP. It will be the main beneficiary of the Muslims' sense of disappointment with "Maulana Mulayam". For the moment all it has to do is sit back and watch the Chief Minister tie himself in knots while trying to please both the secularists and the saffron outfits. His allies have accused him of having "entered into a pact with Mr Advani" for becoming the chief minister. The language of the "disowned document" too created the impression that his political priorities were different from what they were in 1990 when he had stopped kar sevaks from entering Ayodhya. Be that as it may, with the Congress playing hard to get, he has few options. The saffronisation of politics is a development that cannot be wished away. Going by the example of several secular parties, who are part of the National Democratic Alliance, it is now considered wise to be "flexible" in politics. Mr Mulayam Singh too evidently wanted to follow the new trend and keep his options open with an eye on the next year's Lok Sabha elections. But the howl of protest over the controversial affidavit from his Muslim constituency and leftist friends made him beat a hasty retreat. THE Supreme Court's September 16 decision prohibiting disinvestment in two major public sector oil undertakings, HPCL and BPCL, had put paid to the government's disinvestment plans. On Monday, the apex court agreed to take a fresh look at the judgement, giving a ray of hope to the government. The court may or may not revise its earlier decision but the pro-privatisation lobby is happy that the door firmly shut in its face has at least been unbolted. The court has underlined the fact that it is primarily concerned whether disinvestments required parliamentary approval and whether it was legally permitted. However, it can be expected to keep in view the secondary factors also which have occupied centrestage following the decision. Relying on the HPCL-BPCL judgement, many petitioners have flooded high courts with appeals challenging even those orders regarding privatisation of PSUs which had been taken before the September 16 judgement. The end result is that the privatisation process has almost come to a halt. Monday's decision to not only re-examine the earlier verdict, but also to stay high court proceedings challenging the privatisation of some companies can end the logjam. While the government will hope that the Supreme Court will take a more liberal view of the various provisions, the fact is that its difficulties are not entirely of the court's making. It is just that there is illogical fragmentation in Parliament and any privatisation matter that goes before it is destined to get bogged down. The Congress started the privatisation process but now that its rival is taking it forward, it has decided to oppose it. While it argues in Delhi that profit-making PSUs should not be sold, it has no qualms about doing exactly that in states where it is in power. The court has not questioned the disinvestment process but the opposition has itself given such a spin to the judgement. The review will, hopefully, clear the fog. CHIEF MINISTER in this country usually tend to blow out of proportion their own achievements, real or imagined. Here is an exception: the Punjab Chief Minister, Capt Amarinder Singh. He seems to have developed a knack for creating a controversy where none exists. While on a visit to Bhopal to campaign for his counterpart there for the coming Assembly elections, he chose to run down his own state while praising the pace of development in Madhya Pradesh. Addressing a press conference, he took pains to explain how Madhya Pradesh had marched ahead of Punjab, having, perhaps, nothing better to say. Chief Minister Digvijay Singh, he said, had implemented all points of the panchayati raj, while he had implemented not even one. The dropout rate in schools in Punjab was higher than that in Madhya Pradesh. Teachers and doctors in both the Congress-ruled states remained absent in large numbers. If the Madhya Pradesh Government had a public debt of Rs 36,000 crore, his own government’s track record was even worse: it had a public debt of Rs 42,000 crore despite the state being much smaller. Thank you, Capt Amarinder Singh for telling the truth. People had generally stopped talking about the massive pile-up of debt. Even frequent interruptions in power supply had been accepted as a way of life and few asked what had happened to those power reforms. The Punjab Finance Minister had recently made it known that the government required an economic adviser since whatever steps it took to mop up additional resources had to be abandoned under public or political pressure. The Chief Minister also perhaps requires a speech writer. If he already has one, a replacement is urgently called for. Having a knowledge of shortcomings in the state administration is not enough; Capt Amarinder Singh has, perhaps, forgotten that he has been elected to head the government to tackle the problems he has noticed in Punjab. I share no one’s ideas. I have my own. Sub-Article (3) of Article 105 of the Constitution makes an enabling provision for defining the powers, privileges and immunities of each House of Parliament as well as its members and committees. A similar provision is there in Sub-Article (3) of Article 194 in respect of a House of the legislature of a state. So far, no-legislature has invoked these articles for defining its powers, privileges and immunities so that a fair and proper procedure could be established without affecting the freedom of the citizens to legitimately express their views. As is well-known, the power vested in the legislatures for the contempt of the House is of an exceptional nature. If the matter is purely internal and relates to proceedings of the concerned House not affecting the rights of a citizen, no more questions may be raised in view of the constitutional scheme. The majority decision in Narasimha Rao’s case reported in 1998 clearly indicates that in respect of matters involving corruption, the courts cannot interfere with regard to internal proceedings of Parliament. This was a majority decision. Several jurists have reservations even regarding this ruling as it raises debatable issues such as condoning of bribery which would be subversive of the rule of law, apart from dissenting views of the judges in the case. However, the present legal situation is that purely internal matters of the House cannot be gone into. Where, however, the fundamental rights of the citizens are involved, the courts come into the picture to interpret the constitutional provisions and adjudicate on the issues involved in a given case. 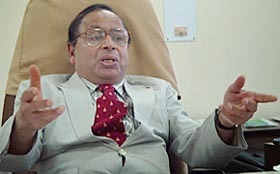 The National Commission to Review the working of the Constitution (NCRWC) and, in particular, Mr Soli Sorabjee, the present Attorney-General for India, are votaries of freedom of the Press. They are in favour of an express provision being made in the Constitution to insert a fundamental right which would include freedom of the Press and other media. The commission felt that the time had come to define and delimit the privileges which were necessary for the free and independent functioning of Parliament. It also noted that it should not be necessary to run to the 1950 position pertaining to the House of Commons whenever a question arose on the issue of immunity or privileges of a Member or the House. Similar would be the position regarding the privileges and immunities of the state legislatures. It is rather unfortunate that such an important recommendation of the NCRWC has escaped the attention of all those concerned about the fundamental rights of the citizens. It is also necessary to emphasise that neither the legislatures nor the courts are supreme, but only the Constitution of India is supreme. As such, any episode involving the freedom of the citizens and the Press must be viewed objectively. One should not forget that the basis of the privileges of the Houses in India is the privileges available to the House of Commons in England where there is no written Constitution. And yet, strong conventions have been built in that country so that values of the Constitution are not overlooked. India has a written Constitution and its record of constitutional conventions has hardly been evaluated by anyone. Therefore, it may be much safer to rely upon codification of the powers, privileges and immunities of the legislatures. This task has to be performed by each House concerned and has to be done with circumspection so that fair play is in evidence. Any action taken by the House in pursuance of its rules should never smack of highhandedness, arbitrariness or vindictiveness. The genius of the Indian people could be trusted to evolve suitable procedures in the process of codification of privileges of each House so that the Houses are able to perform their functions and duties without any let or hindrance in the interest of the people who have elected them. Of course, “careless reporting and distorted comment” have to be avoided as observed by Frank Thayer. In Keshav Singh’s case (1965), the Supreme Court had laid down that the fundamental rights of a citizen cannot be subordinated to the privileges of the legislature and that the court can exercise power to issue a writ of habeas corpus in an appropriate case. It also held that the Rules of Procedure of the Legislature are subject to the provisions relating to the fundamental rights. It hardly needs to be emphasised that the expression “State” as defined in Article 12 of the Constitution includes the legislatures. The present case should not cast its shadow on Centre-state relations which are equally important for the survival of democracy in the country. It is, therefore, hoped that restraint will be exercised by all organs of the State, that they will act with maturity, and constitutional values will be respected by all concerned. You would understand what I mean if you have had the ill-luck to be bitten by a friend’s pet dog. You are told reproachfully. “He has never bitten anyone, I wonder why he bit you?” The fond owner has a fresh look (at you stupid, not the dog! ), making you feel that the dog was smart enough to recognise your talent criminal tendencies! You could also be bitten by one of the hundreds of stray dogs. Sometime back a programme to sterilise the stray dogs was started with great fanfare. I don’t know about the statistics (I wonder who said, “There are lies, damned lies and statistics!) but each time I step out I find more stray dogs, not less. As if this was not enough the hapless citizen has now to deal with vicious pigs, violent cows and bulls, which maim or gore people to death. What all do we watch out for? Thieves, thugs, rapists, unclaimed objects, dogs, cats, pigs, cows, bulls, electric wires .......... The city fathers must sit up and take notice before the City Beautiful acquires another adjective, City Dangerous. The tourist may reconcile to not having five star facilities but is he expected to take impromptu bull-fights on the road in his stride? In a case a delegation is packing bags to study the menace abroad, let me inform you about something that you already know: there are no stray animals, even in the other Asian countries. In fact if you take your pet for a stroll, it’s mandatory to carry a bag, to pick up the droppings. Let me clarify my position before I am slaughtered by the animal activists. I LOVE ANIMALS. In fact, the more! I see of human nature, the more I love my dog. I am a devout Hindu and consider the cow sacred. But simply not killing these stray animals, and letting them survive on rubbish, making them cope with traffic which is tough even for us, is tantamount to criminal inaction. This is indifference, NOT kindness. I also love Chandigarh and am pretty emotional about my heart being always in the open hand, no matter where is the world I am. Each time I undertake a journey, I have to call up my children and tell them that I reached safely. Now, I feel the need to do it each evening as I return from my evening walk. So if a good Samaritan starts a SPFH — a Society for the Protection of Human beings, I would like to enroll. How else do I survive the multi-pronged onslaught? AS the man behind the cash counter holds up your currency note against light or turns it over, you miss a beat. What if it is fake? Will he or won’t he accept it? As you jingle gold bangles, you worry, if these are of pure gold or not? As you read headlines of intruders being shot crossing the LoC in Kashmir, you wonder, if there is a system to detect trespassing? As you wait your turn in a clinic, you wish, if there is a device to draw a blood sample, analyse it within a few minutes and detect diseases, if any? As a farmer you feel concerned about the birds pecking at ripening fruits and grains and think, if there is a device to scare birds away? Not many of us know that some 600 scientists are quietly engaged in finding answers to such questions in Chandigarh at the 125-acre CSIO — Central Scientific Instruments Organisation — in Sector 30. The Director, Dr Ram P. Bajpai, demonstrates the “fake currency detector” that tells you whether the Indian or foreign currency notes in your wallet are genuine or a gold analyser confirms the “purity” of your gold bangles. The fake currency detector is now being upgraded to spot-out fake stamp papers, postal stamps and also ‘’stack, staple and sort out fake currencies’’. The Rs 23,000-crore stamp paper scam has spurred the CSIO into action. As you enter the CSIO, right in front, on the ground floor, is a fibre optic net that you have accidentally fiddled with. It has set off an alarm. Well, you have sensitised a “fibre optic intrusion detection system”, which is now ready for installation on the LoC to check cross-border infiltration that had bothered you. And as you step back alarmed, you have set off yet another beep! On the ground are spread out green rectangular mats, which you mistook to be doormat and stepped on them. These too are yet another security device that can be camouflaged beneath the earth. The alarm rings, when someone steps on it. And there is that “electronic bird scare” that our farmer friend was looking for his orchard and grain-filled fields. And the device or disposable kit you had hoped would take a blood sample and analyse it in a few minutes to diagnose for tuberculosis, malaria, hepatitis-B and AIDS, is also right there on the research shelves. And such a diagnostic test will cost only Rs 15 to 25! Dr Bajpai affirms that technologies based on nano and biomolecules will have multiple applications in diverse fields and will mean businesses worth billions of dollars in the world market, as nanotechnology and biomolecular electronics research activities are the next generation technological revolutions. Their pursuit will enable India harvest benefits of bionanotechnology. Nanotechnology, simply put, is a technology that involves devices of the dimension of 5,000 to 50,000 times smaller than the diameter of a human hair. And electronic devices based on biomolecules, such as DNA and protein, are called the biomolecular electronics. Credit goes to Dr Bajpai, who has transformed traditional labs into sophisticated, state-of-the-art labs that shape ideas into reality and marketing them through scientific instruments. While, some research on instrumentation for “strategic and defence applications’’ is classified, some research and design projects are targeted at societal benefits. The range of research, design and development of scientific instruments, encompassing 14 disciplines, stretches from agri-electronics to avionics, aerospace to security sensors, snow and avalanche monitoring devices to seismographic instruments, fiber optics and opto electronics to medical electronics and metallurgy. All this has placed CSIO among the top five national laboratories. It is just one of the 38 labs set up by the Council for Scientific and Industrial Research (CSIR) in October 1959. Dr Bajpai is also credited with expanding the prestigious Indo-Swiss Training Centre from a single three-year diploma course in instrument technology to two four-year advanced diploma courses — one in mechatronics and industrial automation and the second in dye and mould making, attracting boys and girls, after matriculation. For just 70 seats, approximately 25,000 students appear in the entrance test every year. “Majority of students find placement much in advance of completion of their courses at attractive salaries. More girl students are welcome to ISTC’’, he adds. Scientists have made ‘snow and avalanche monitoring devices’ used at high altitude, gadgets for seismology and are now focusing to electronically man the unmanned railway crossings or to avoid head-on mishaps, when two trains speed toward each other on the same railway track. Devices to check such mishaps and halt trains in their tracks are now on the assembly-line. Incidentally, CSIO crossed Rs 1,000 lakh of external cash flow in 2002-03. Scientists filed 16 patents in biomolecular electronics, fibre optics, energy monitoring, opto electronics, medical electronics and metallurgy at the national and international levels in 2002-03. Sixtytwo more are in the pipeline. In agri-electronic instrumentation, work is on evaluation of proteins in soyabean, oil cakes and other foods, portable kits and instruments for quality control of edible oils and digital moisture probe. There is a project on development and supply of portable analog seismograph and a study of seismicity in and around Chandigarh. One may not worry about driving at night or facing glare of on coming vehicles. A night driving filter is on its way. Scientists feel it is time to make computers “think’’. CSIO transfers its technology to private, public sectors for mass production of scientific instruments at affordable rates to benefit society. Nawaz Malik, a beautician, said scores of beauty parlours had sprung up in the past four or five years in Islamabad, which has a population of 800,000. In the port city Karachi, the figure was in hundreds. Gone are the days when women in Muslim-majority Pakistan would hire people to take care of their attire and make-up at home while getting ready for functions. The boom in the beautification industry might be partly attributed to the increasing number of women entering the workplace. Even though the figure is merely 13.6 percent, it is a boom compared to the less than 10 percent in and before the 1990s. In the wake of the 9/11 attacks, Western funds flooded Pakistan for its support to the U.S., positively impacting the economy and businesses. As more Western enterprises entered Pakistan, women, particularly those well-educated, found it easier to get jobs and felt peer pressure to look good. “I have to look gorgeous every day to match the decent company I am with,” said Rabia, a 23-year-old accountant. “My boss will be peeved if I have not been at a beauty salon for a couple of days,” she joked, adding that she spent almost half her monthly income on beautification. One should also not overlook the number of young housewives who go to beauty parlours every other day, regardless of whether they are going partying or not. The owner of Aslam parlour says it opens early every morning for a particular client who gets her make-up done before her husband wakes up, boasting that she has to look her best for him at all times. Girls aged from 12 to 16 also get beauty treatments before social engagements. Beautician Nawaz Malik feels that peer pressure is largely responsible for the new trend. She said: “If one girl gets her hair streaked, it becomes a must for the others in the group to get it done.” Social activist Nabi Khan cautioned: “It is not safe to say that the increasing grooming power is a signal of the increasing social status of the country’s (60 million) women.” He added, however, that there had been an improvement in the status of women. The enlightened persons are fit to our association, let me hear the words which are beneficial to all. We shall always see which is good to all. Be grateful to him who curses you, for he gives you a mirror to show what cursing is, also a chance to practise self-restraint; so bless him and be glad. Without exercise, power cannot come out; without the mirror, we cannot see ourselves. The Man of God speaks the truth and is never false. He follows the Guru’s word and lives in God’s will.